This is a Chinese name; the family name is Na. 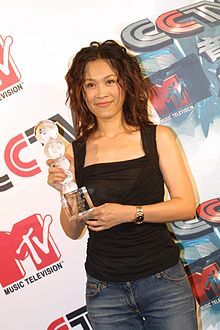 Na Ying (born 27 November 1967) is a Chinese vocalist. She is considered as one of the best present-day female singers in Mainland China, having sold more than 10 million albums. She is also noted for her buoyant and forthright personality. She has been a judge of Chinese TV singing shows like The Voice of China. Na was born in Shenyang, Liaoning. She is an ethnic Manchu, a descendant of the noble Yehe Nara clan of the Qing dynasty. She became a member of the Liaoning Juvenile Broadcasting Chorus in 1979, and the Shenyang Singing and Dancing Troupe in 1983. Na won several national singing contests in the 1980s, and received vocal training from the famous composer Gu Jianfen (谷建芬). Na's father was a doctor. He wanted her to have a good education and become a doctor when she grew up. However, Na exhibited a natural talent for singing, and was determined to become a singer instead. Na began her recording career in 1988 in Taiwan and Hong Kong. She released her first album Dreaming With You, in 1994. Following the release of that album, she released several additional albums, becoming one of the most popular Mandarin-language artists of Mainland China. At the 1998 Spring Festival Gala show hosted by CCTV, Na sang a duet "Meet in '98" (相約一九九八) with Faye Wong. Wong had already achieved fame in Hong Kong and elsewhere, but the performance with Na brought her to superstar status in China itself. Na had a relationship with Chinese footballer Gao Feng and a son by him, but they separated in 2005. She married Meng Tong in 2006, and they had a daughter in 2007. Although she devoted time to her family and children from 2002 to 2009, she never quit the stage, and had a prominent role at the closing ceremony of the Beijing 2008 Summer Olympic Games. At the close of 2009 she performed the concert "20 Years of Na", a retrospective of her stage career, at the Capital Gymnasium. Although her 2009 single "The Journey of Love" topped the charts wherever it was released, her early song "Follow Your Instinct" remains her favourite. After a hiatus of nearly nine years, Na returned to the music scene in 2011, releasing a new album called So... What?. The album reached the number one position on both the mainland China and Taiwan album charts. In 2016, Na appeared on the first season of the show Sing! China, along with Wang Feng, Zhou Jielun, and Yu Chengqing. She will also be on the second season of the show which will premier July 2017. On 11 October 2017, Na announced through a letter that she would be resigning as a coach from Sing! China. The following are a selection of her albums released from 1994 to 2015. ^ a b c d e "Na Ying, judge on 'The Voice of China'". China.org.cn. 2012-08-31. Retrieved 2013-02-10. ^ Chinese A-list entertainers to perform in CCTV gala, Xinhua, February 13, 2010. This page was last edited on 31 March 2019, at 15:15 (UTC).